ABP Food Group has confirmed that it will be extending its range of online beef products for Chinese consumers on the JD.com platform from three product lines to ten product lines. The announcement was made during a visit of its Chinese distribution partner Hopewise to ABP Clones. 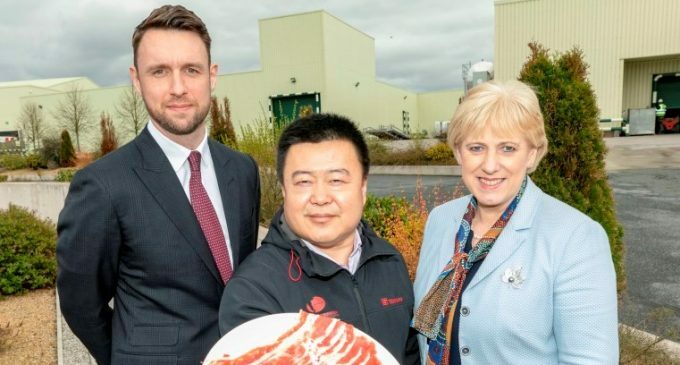 Hopewise was the first company to import Irish beef to China. JD.Com is one of the largest business-to-consumer online retailers in China by transaction volume and revenue, with 301.8 million active users. ABP beef is supplied to JD.Com through the Hopewise distribution network in China. The process of purchasing beef products online is one of the fastest growing trends in the Chinese market. In February 2018, ABP became the first European beef company to agree contract arrangements with Chinese customers. In July, the company signed an export agreement with Hopewise where ABP ships beef cuts to Hopewise processing facilities in Shanghai and Beijing. The product is then processed into consumer packs, with consumers able to purchase for direct home delivery via the JD.com platform on their phones. Pictured at the ABP announcement are (L-R): Mark Goodman, Managing Director of ABP’s International Division; Sun Yong Li, Chairman of BJ Hopewise; and Minister for Business, Enterprise and Innovation, Heather Humphrey’s, TD.